© 2019 KFMB-TV. All Rights Reserved. A police operation is underway in a Brussels neighborhood in connection with the November Islamic extremist attacks in Paris, French President Francois Hollande said Friday. Two French police officials have told The Associated Press that Salah Abdeslam, the main fugitive from Islamic extremist attacks in Paris in November, has been arrested in Belgium's capital after four months at large. They said he was arrested Friday in a major police operation in the Brussels neighborhood of Molenbeek. Both officials are in contact with people involved in the operation and spoke on condition of anonymity because they were not authorized to speak publicly about an ongoing operation. Abdeslam was among several attackers who targeted cafes, a rock concert and a stadium in Paris' deadliest attacks in decades, which killed 130 people. French President Francois Hollande says an important police operation is underway in a Brussels neighborhood in connection with the November Islamic extremist attacks in Paris. Hollande told reporters in Brussels on Friday that he would not give details on the "operation that is under way." Hollande confirmed that the person being sought was linked to the Paris attacks but that any speculation over the fate of the individual would run counter to efforts "to stop or neutralize this individual." Molenbeek Mayor Francois Schepmans confirmed two people injured in the operation, which she said are continuing, but that she couldn't confirm Belgian media reports Salah Abdeslam, the main fugitive from the Paris attacks, was one of two people hurt. Police have descended in force to search a residence in the Molenbeek neighborhood of Brussels, and Belgian media are reporting gunshots have been fired. RTBF French-language TV reported late Friday afternoon that two people had been wounded. The raids come after Belgian authorities said that fingerprints in an apartment raided earlier this week in another Brussels neighborhood belonged to the main fugitive from the Nov. 13 Paris attacks, Salah Abdeslam. As events unfolded, Belgian Prime Minister Charles Michel rushed out of a European Union summit, and was expected to be joined at Belgian government offices by Interior Minister Jan Jambon, RTBF said. This is a story update. The previous story is below. BRUSSELS (AP) — A police operation is underway in a Brussels neighborhood in connection with the November Islamic extremist attacks in Paris, French President Francois Hollande said Friday. The mayor of the Brussels neighborhood of Molenbeek, Francois Schepmans, confirmed two people were injured in the operation, which she said are continuing. She couldn't confirm Belgian media reports that Salah Abdeslam, the main fugitive from the Paris attacks, was one of two people hurt. The raids come after Belgian authorities said that fingerprints in an apartment raided earlier this week in another Brussels neighborhood belonged to Abdeslam. A man shot dead in that raid is believed to have been an accomplice of Abdeslam, Belgian prosecutors said Friday. Two men escaped from the apartment during a protracted exchange of gunfire with police, and one might have been Abdeslam, they said. "It's possible," said federal prosecutor Eric Van der Sypt, though he said no further information would be made public so as not to jeopardize the investigation. "All I can confirm is that the fingerprints of Salah Abdeslam were found in the apartment in Forest," a neighborhood of Brussels, he said. He said it was possible the fugitive had spent "days, weeks or months," there, but that it was too early for investigators to known for certain. Abdeslam, 26, fled Paris after the Nov. 13 gun and bomb attacks that killed 130 people at a theatre, the national stadium and cafes. Most of the Paris attackers died that night, including Abdeslam's brother Brahim, who blew himself up. The Brussels-born Abdeslam, a childhood friend of suspected ringleader Abdelhamid Abaaoud, is believed to have driven a group of gunmen who took part. The Islamic State group claimed responsibility for the attacks, in which Belgian nationals played key roles. On Tuesday, a joint team of Belgian and French police showed up to search a residence in the Forest area in connection with the Paris investigation, and were unexpectedly fired upon by at least two people inside. Four officers were slightly wounded. An occupant of the residence was shot dead by a police sniper as he prepared to open fire on police from a window. Police identified him as Mohamed Belkaid, 35, an Algerian national living illegally in Belgium. A Kalashnikov assault rifle was found by his body, as well as a book on Salafism, an ultraconservative strain of Islam. Elsewhere in the apartment, police found an Islamic State banner as well as 11 Kalashnikov loaders and a large quantity of ammunition, the prosecutor said. Belgian authorities initially said Belkaid had no known background in radical Islamic activities. 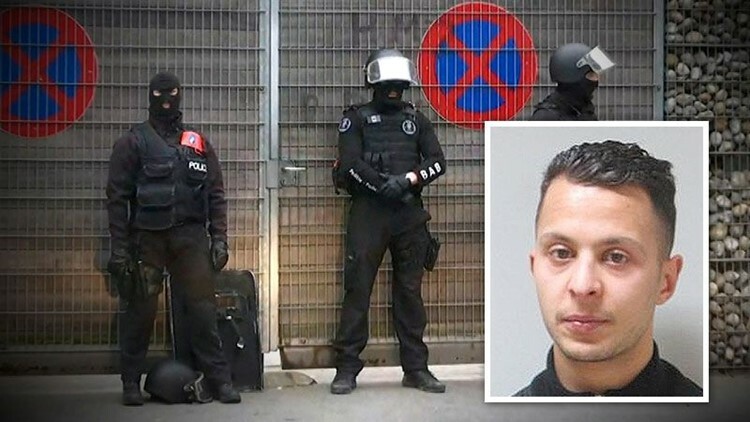 But Friday afternoon, prosecutors issued a statement saying he was "most probably" an accomplice of Abdeslam who had been using a fake Belgian ID card in the name of Samir Bouzid. A man using that ID card was one of the two men seen with Abdeslam in a rental car on the Hungarian-Austrian border in September. Four days after the Nov. 13 Paris attacks, the same false ID card was used to transfer 750 euros ($847) to Hasna Ait Boulahcen, Abaaoud's niece. Both Ait Boulahcen and Abaaoud died afterward in a police siege. Abdeslam slipped through a police dragnet to return to Brussels after the bloodbath in Paris, and though the target of an international manhunt, has not been found since. In January, Belgian authorities said one of his fingerprints was found alongside homemade suicide bomb belts at an apartment in another area of Brussels. Belgian prosecutors said it wasn't known whether he had been at the address in the Schaerbeek district before or after the Paris attacks, or how long he had spent there.